Situated in one of the last remaining unspoiled acacia woodlands on the southern edge of the Ngamo Plain, the flagship Camelthorn Lodge offers a truly memorable safari experience. The centerpiece of this beautifully designed lodge is the huge ancient Camelthorn tree that spans the 35 meter dining area, making this the perfect spot to enjoy your evening meal or morning coffee. Camelthorn Lodge is located approximately 4-5 hours drive from Victoria Falls, on the south-eastern corner of Hwange National Park. Why not travel to Camelthorn Lodge in style aboard The Elephant Express, a 2 hour rail journey from Dete Station to Ngamo Siding. Guests will be accommodated in one of eight luxuriously furnished forest villas. each with a private en-suite bathroom with a bath and feature window overlooking the woodland, large shower, closed off toilet, fireplace, a private ground level deck, upstairs outdoor maisonette with hammock and day bed and electricity by diesel/solar generator. 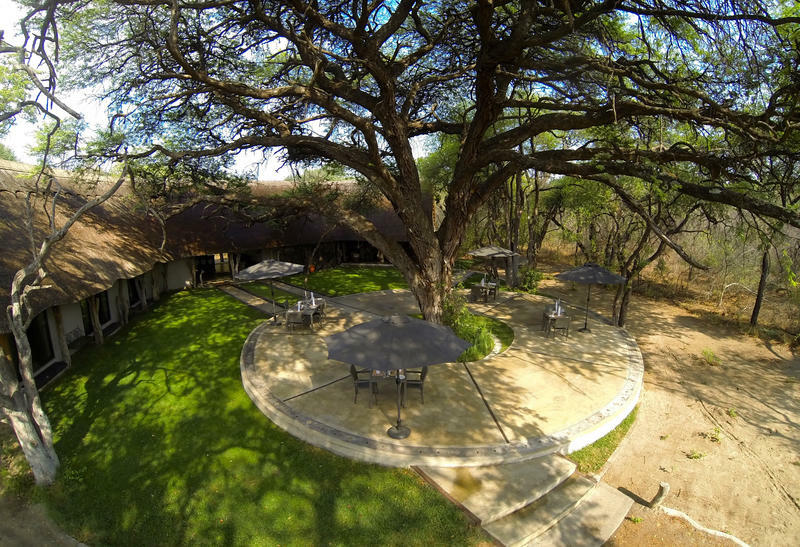 The Main lodge features free WiFi and cell phone reception and is a magnificent stone structure with thatch roof built in an open U around the lodge’s splendid name-sake – the Camelthorn Tree. The Western wing is a closed in dining room protected from the elements featuring 3 fireplaces.The central portion of the main lodge is an open fronted reception area and lounge. The Eastern wing has open fronted bar and lounge area on a raised teak deck. Within the U lies an open patio area under the Camelthorn, ideal for enjoying leisurely brunches and candlelit dinners under the stars on warm evenings. Game drives at Camelthorn are structured to fit you, and are conducted by licensed guides in our specialised land rovers. On your morning game drive break you will be served tea, coffee and biscuits and in the afternoons, cool drinks and cooked snacks are served at sunset in front of a waterhole. Experienced fully licensed armed guides conduct game walks across the magnificent Ngamo Plains as well as deep within the fascinating and diverse woodlands that surround them. The perspective on foot changes dramatically, from close ups of Hwange’s famous elephant, to eye-to-eye with small reed frogs – these game walks will provide memories for a lifetime! Whether conducted after returning from a sunset game drive, or after dinner when the lions are calling, a night drive using red filtered spot lights opens up a whole new world populated with species seldom seen in the daylight such as zorillas, selous mongoose and lesser bush babies and of course the thrill of driving at night amongst hunting predators is always a highlight. Hwange National Park has no major rivers and for the past 70 years during Hwange’s dry seasons wildlife has subsisted here on water originally pumped by windmills, but which were later replaced by diesel engines. The engines require diesel, oil and monthly services and the pump attendants who operate them require rations and pay. A popular activity is to take an all day trip into the Park visiting the waterholes to drop off fuel and oil for the motors as well as rations and supplies for the pump attendants. A picnic lunch is then enjoyed near one of the waterholes followed by a leisurely game drive back to the lodge in the afternoon. Our Pump run usually ends with sundowners at one of the waterholes close to camp. Please note this activity only happens in the dry season when the water is pumped (usually between June – October). In the green season an all-day game drive can be enjoyed roaming across a huge section of the park stopping for a picnic lunch and siesta under a cool tree near a lily-covered pan. When Camelthorn Lodge was built deep in a patch of woodland, we didn’t want to attract large numbers of tree hungry elephant, so we couldn’t have a big waterhole in front of our new flagship lodge. But we still wanted a very special wildlife experience for our guests. About a kilometre (five minutes’ drive) from Camelthorn we installed our elephant-proof hide at toe level and within splashing distance of the grey giants that drink here. It boasts a flush toilet and water on both the sunrise and sunset sides. Strategically positioned in the shade of a Leadwood tree and disguised as an antheap, the sheer thrill of sitting in our blind in safety and comfort close enough to elephant to count the cracks on their toe nails has surpassed every one of our expectations. The open grasslands and forest groves of the Ngamo Plains around Camelthorn Lodge are among the most scenic areas of Hwange, as well as being home to a variety of wildlife, big and small. The landscape changes dramatically between the cooler dry winters and warm humid summers. This special scenery is ideal for horse-riding and several activity options have been designed for riders of different experience levels. All rides are led by our experienced, qualified guides and trackers. The pace is determined by safety and terrain and is mostly fast walking and trotting. Where possible in open areas we will canter and gallop. We look at our riders’ experience and tailor the pace accordingly. *Weight and age restrictions apply.